Turkish newspaper says that the Istanbul's chief prosecutor's office has prepared an extradition request for him. 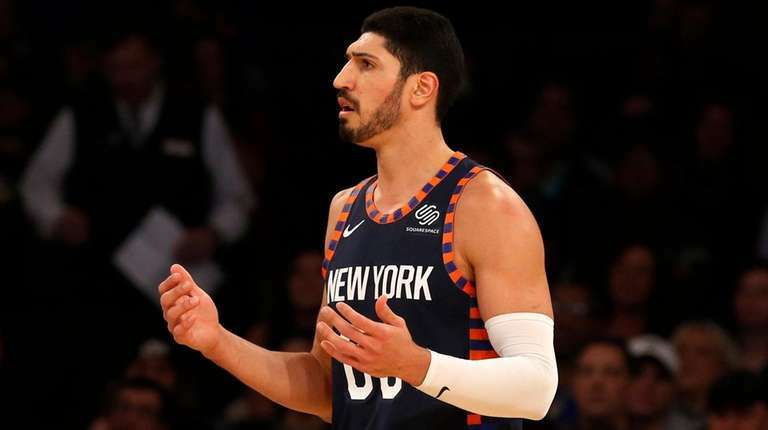 ANKARA, Turkey — Turkish prosecutors are seeking an international arrest warrant for Knicks center Enes Kanter, accusing him of membership in a terror organization. Sabah newspaper says the Istanbul chief prosecutor’s office has prepared an extradition request for him. Officials at the prosecutor’s office could not be reached by The Associated Press for comment. “I don’t even have a parking ticket in the U.S.,” he wrote Wednesday. Knicks coach David Fizdale said in London on Wednesday that he didn’t know about the report. Teammate Mario Hezonja is a close friend of Kanter’s. Kanter has been an outspoken critic of Erdogan, and his Turkish passport was revoked in 2017. This time, Sabah says prosecutors are seeking an Interpol “Red Notice” citing Kanter’s ties to exiled Muslim cleric Fethullah Gulen, who is blamed for a failed coup in 2016, and accusing him of providing financial support to his group. Kanter said he feared assassination if he left the U.S. or Canada when he announced last week that he wouldn’t travel with the Knicks.. The team said at the time Kanter wouldn’t make the trip because of a visa issue. While the Knicks are overseas, Kanter has posted a number of photos of himself meeting with U.S. congressmen. He also wrote an opinion piece in the Washington Post explaining his decision and his reasons for standing against Ergodan.